This book is all about real life in the real world and about Jesus - because as the book says, the two go together. It is designed to be placed in the hands of the curious and the critic. It can also be used with the High School SRE (Special Religious Education) lessons and for use independently. The content is fantastic and the graphics are awesome. The book also includes an audio disc with an MP3 version of John's Gospel to listen to. 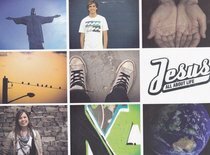 About "Jesus All About Life"